TENO Honor Badge for 1922 (TeNo; Technische Nothilfe). Maker marked 'Wilhelm Fühner'. Numbered 5217. Approx 36 mm x 49.5 mm. Top condition. No damages. Working needle and catch. TENO hedersutmärkelse för 1922 (TeNo; Technische Nothilfe). Tillverkarmärkt 'Wilhelm Fühner'. Numrerad 5217. Absolut toppskick. Inga skador. Fungerande nål och hake. The Technical Emergency Service or Teno established in 1919 was a voluntary organization that would standby in case of an internal threat in Germany. These awards can be found with dates from 1919-1923 and were actually not instituted until 1934, making the Honor Badge a retroactive award slated for long time members with significant contributions to this branch of service. Award recipients would have to have been a member of the Teno for the years 1919-23. 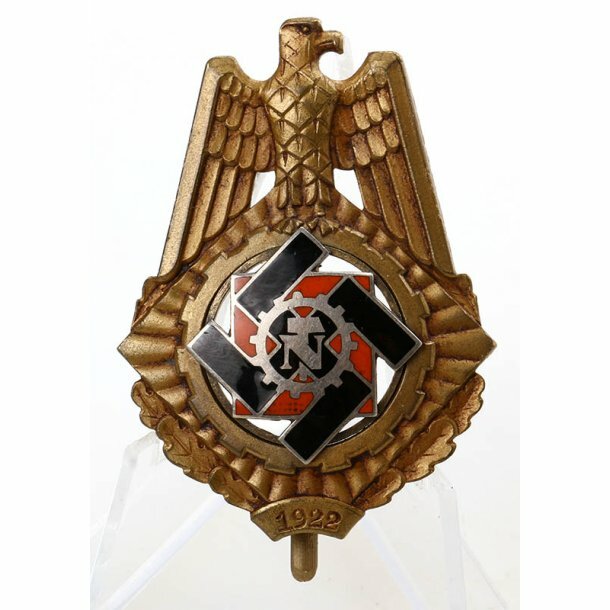 The award is bronze and it is estimated that 5500 were awarded, a rather small amount and not a common badge with the most common dates being 1922 and 1923 from what I can tell. It would appear there is no correlation from the year of the badge and the assigned number of the recipient so once can find a 4 digit on an earlier badge and a lower digit on a later badge, why this is I do not know.